This week we are launching another big project for Permanent Style: The Guide to Cloth. This has been a long time in the works, but we wanted to do it right. There is a lot of piecemeal information out there about cloths, yarns and weaves, but (for me) nothing considered and comprehensive. The aim is to gradually build an in-depth, practical guide with information at every level of detail. We will start with basics – how to examine cloth, what defines a jacketing – and steadily drill down further and further, until (perhaps) we’re differentiating between different breeds of merino. We also aim to be responsive, so while the first few pieces are planned (and will be published regularly every fortnight), we are open to all ideas and thoughts on what would usefully add to this central resource. As ever, it is your input, comments and questions that make Permanent Style what it is. I believe the guide will be useful to both customers of bespoke, who regularly have to imagine what a small square of wool will look like draped around their body, and those buying ready-to-wear, who have to make equally crucial decisions about the style, weave or weight of cloth when buying a suit. The Guide is being sponsored by Scabal. This has been extremely useful in terms of access to people and expertise, but has also enabled us to fund the development of a micro-site to host the Guide. The micro-site will live within www.PermanentStyle.com, but will be a dedicated area where the whole Guide can be browsed independently. It will be launched once we have the first few articles under our belt. It’s important to note, however, that the content of the Guide will be entirely independent and objective. Each article is based on input from several experts, at tailors, mills, merchants and even academics. Scabal’s involvement is similar to the display advertising we carry elsewhere on the site. On the right-hand side of each article, they will suggest and recommend cloths from their range that are related to the content. I believe this will be genuinely useful, but more importantly, it retains the clear distinction between editorial and advertising that we always seek on Permanent Style. The first article will be published on Wednesday, and the next in two weeks’ time. I do hope you find them useful – I can’t wait to start rolling out the whole breadth and depth of the coverage over the coming months. You can follow the discussion on Introducing: The Guide to Cloth by entering your email address in the box below. You will then receive an email every time a new comment is added. These will also contain a link to a page where you can stop the alerts, and remove all of your related data from the site. Thank you for making it clear that this series will be sponsored by Scabal. While I can understand the financial imperative for such a large programme of articles am I the only one who feels slightly “queasy” about this? I am not suggesting for a second that either Mr Crompton or Scabal would attempt anything underhand (perish the thought) but somehow, and I can’t explain why, it just does not feel right. I guess as a long term reader (and occasional commenter) on Permanent Style this just seems a move away from what I have always considered a model of objectivity and public engagement. I am not expressing this very well because I am sure it will be objective but I don’t feel I will be able to enjoy it as much as other articles and as such I think I might have to give it a miss. It will be interesting to see how other feel. I have to mirror John’s concerns about the role of Scabal. Initially when I read the first few lines of this post I was very excited, only to read on and feel the excitement diminish. Hopefully this won’t be the case though, as l am also a long-term reader. I am interested to see how far you’ll go with the topic since, for example, it’s been a dream of mine to go to Scotland and meet a traditional weaver first-hand to commission a length of tweed for a suit or sport-coat. I’m unfamiliar with the full scope of these cloths in weight, style, etc. as they vary from smaller sources like Breanish tweed, Irish tweeds such as those from Donegal, or the standard offerings from a cloth merchant such as W BIll. I also remember the post you wrote years ago about Breanish tweed, so hopefully there will be more of this kind of depth. This is just one cloth example of where I’ve had a long-standing interest for more information. So like Hristo, I also understand the significant importance of cloth as one goes further into bespoke clothing and am very familiar with the London Lounge Cloth Club. It’s great to see you put this intention into action since I too recognize the need for this type of information. I just hope that the phrase, “and steadily drill down further and further, until (perhaps) we’re differentiating between different breeds of merino,” will lead to more than a teased idea and will offer, as suggested, a knowledge and resource base that isn’t limited to the world of Scabal. Thanks Tim. I understand your apprehension, but don’t worry this will in no way be limited to the world of Scabal. It is a full, broad guide to cloth that (perhaps a little ambitiously) also aims to go into the kind of depth you suggest. Good idea to make such a guide. For me the fabric choice has become the most important part of the bespoke ordering process. I already know which tailors and styles I like. So the fabric choice is THE huge dilemma. And due to limited resources I hate to make wrong decisions regarding the fabric. It is such a waste to invest a pile of money and 60 to 80 hours of your tailor’s time to end up with a piece which has limited use due to an impractical fabric choice. My first commissions were made of fabrics that were too formal for my needs. I think it is very good that you state openly that this series is sponsored by Scabal. It is clear that you can’t run such project without sponsoring. And it is much better to be transparent. I stopped reading one popular French blog about bespoke tailoring because I really hate how they have some obvious advertising articles without stating that it is an advertisement. I hope that you will make it clear to the readers that the sources of fabrics are not only such big companies like Scabal (which offer often too light fabrics for my taste). There is for example an online community – The London Lounge Cloth Club, where we discuss what fabrics we would like to have and then commission a mill to create the fabric for us in a small run of 60 or 120 meters. The results are often marvelous. Thanks, and yes I know the club. The initial aim will be to talk about the cloth itself, and not refer to particular mills at all – but we might do that further down the line. Further to your trip to Japan, will you be covering Japan in the Guide to Cloth? The Japanese are quite proud of their textile capabilities, but I don’t think there’s much recognition outside Japan. I am really looking forward to this comprehensive guide to cloth. For those of us late to the party Cloth is a confusing , almost impenetrable subject. As you say there is a lot of information out there but much is shallow and sometimes misleading. Personally speaking I do not have a problem with Scabal sponsoring this series of articles, as I realise that such a project is especially difficult and costly to produce. I live in Los Angeles, where the weather never drops below 50F (10F) in the dead of “winter”. For reference, a 270g fabric is about as heavy as I would go for year-round wear. I am considering a new tuxedo commission and have narrowed down the fabrics to a VBC 230g wool/mohair blend and a VBC 250g pure wool twill. The wool/mohair is crisper and has a more traditionally formal texture but I am afraid it is too lightweight at 230g, even in Los Angeles. What are your thoughts on the way such a fabric would drape and look given the formal nature of the garment? The biggest difference will be in the fabric mix, the mohair, rather than the weight. If you like the look and feel of mohair, go for that. I must admit, as a young guy in his early 20’s, it’s pretty cool to be replied to by a personal style idol. I don’t mean to anticipate the fabric guide, but could you elaborate on the differences mohair makes? Beyond texture and drape, does it change breathability / durability / anything else? Thanks Simon. A post (or a series of posts) highlighting the qualities of the various materials and weaves would indeed be very helpful. This is definetly a very intersting project! Thanks for remaining bold in your ideas and ability to reach out to the right folks and muster the needed resources that such ideas require if they are really worth being implemented. Funnily enough, in the two or three days, I have been browsing PS site and other sites in the hope of finding useful information with respect to cashmere and cotton blend fabrics. And not long ago, I was instead interested in Serge. Is there a reason why trousers or even jackets in this fabric are not easily available off the rack, and who are the best producers. And then, related to what I want to purchase as two Summer suits that could bridge the gap between smart casual and formal suits: what kinds of fabric should or could I consider aside cotton, linen? What about blend cotton and wool? Wool and linen? Are they wearable? Since I’m not at all interested in having a huge wardrobe (an implication of my commitment to “Drake’s philosophy”), my choices should be really spot on. But to do so, I need reliable – — not any – pieces of information. So if I understand what you state today I should find the right answers to my queries on PS in the near future. I’m quite sure that many readers will be very intrerested in the outcome of this new project. Many thanks for your dedication, Simon ! Hi Simon, this will be great project (if done well). There are a number of questions I would already like answering! I know this would be a huge project, but is there any way a database could be built with Hi-Res images that would allow readers to compare fabrics from different mills by parameters such as: price, weight, content, colour, pattern etc.? I’m afraid that would be pretty much impossible, as many mills don’t produce those images, there would be thousands of them, and you’d have to change lots of them every six months. In my experience it is close to impossible to capture the true colours of fabrics on a photo. Especially for shades of blue. Swatch books are many many many times more expensive than a printed catalog. So the fabric merchants would have switched to printed catalogs long ago if this was possible. But unfortunately it is not. Photos simply can’t do the job. Picking up John’s point, I think the important issue is that Simon is transparent in the commercial relationships that impact Permanent Style and I (as before) commend him for that – we know Scabal is sponsoring the run of articles and we can all act according to our interest. Sometime, Simon a picture essay on the weaving process would be a great thing to see. I know you have covered individual elements e.g. design but for those who don’t know how complex it is it would be revealing. I spent summers between University courses and in my early career working at different times with linen weavers, with weavers of industrial fabrics and once with a woolen yarn spinner. The effort that must go in to getting a meter of damask table linen or a length of suiting or shirting out of the weaving shed and still making a profit is challenging to say the very least. Firstly I would say what a potentially invaluable resource this could become to understand a bit about different cloths especially as that knowledge would at least start to inform a buyer rather than be inundated with a huge number of choices when purchasing/commissioning. It is also no bad thing to know something of the qualities of different cloths and their manufacture. 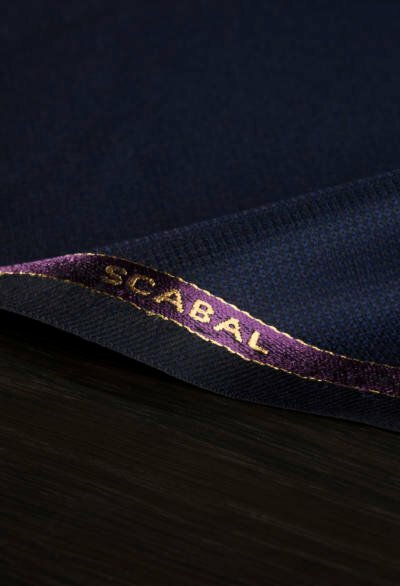 Secondly, I have no qualms about Scabal being involved. Their contribution is transparent and we would always want to see an image of cloths being described – they have to come from somewhere so some company would always get a bit of publicity. No doubt contributors who have experience of corresponding cloths from other sources can contribute? I note a frequent question in many postings on here ask for a catalogue reference for whatever cloth is portrayed. They would indeed be able to, yes. – An informative / educational book about cloth with real swatches (i.e. the only real reference of Grey Flannel is the little bag from a Dunhil perfume I stole from dad’s cabinet a couple of decades ago). – A periodic (year or seasonal) publication with real swathes of cloth that can be purchased online. I am looking forward to this guide. I think it is great that Scabal is on board. I trust your integrity to not let the sponsorship impact the content. How can one guess from a bunch/sample whether a cloth will drape well or not? Softness/hardness, Uk/Italy, wool/other stuff,… weight, hand,..? Another question: you rarely seem to choose Zegna fabrics, any reason behind it? You can’t tell really from a small sample, but cloths that are heavier and harder will drape better. Also usually heavier worsteds rather than woollens, and high-twist yarns. If this is a priority for you, it’s a good thing to ask a tailor about as they will have used lots of types. I do occasionally use Zegna, eg for a cashmere navy blazer, but not that much. Thanks, I am considering a 340g Loro Piana Super150 vs an equivalent at Harrison. As LP feels softer to the touch, is it likely (Italian softness) to drape worse? Or is the feel not the best proxy for hardness? I’v found that cheaper suits (and coats) usually comes in a mix of wool and polyamide. How come? Is the polyamide added simply as a way to cut material costs? Or are there any other befefits? And what are the negative aspects of cloth made of a wool/polyamide mix compared to pure wool? Do you know when most mills launch their S/S 2019 collection? Thanks, helpful to know when commissioning for S/S! Come on guys let’s stop bickering. Give Simon a chance to get this show on the road then we can give a well informed opinion on the general theme of articles as the series unfolds.